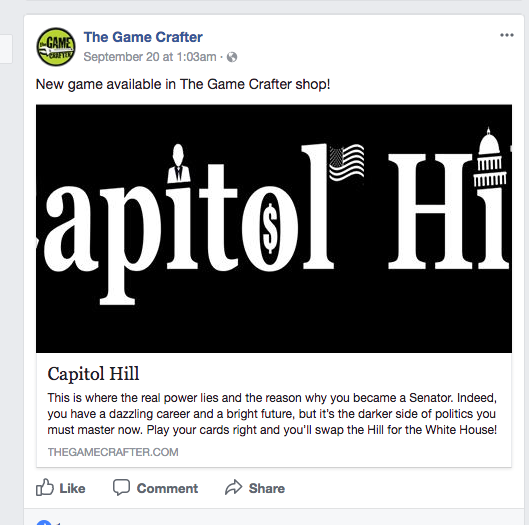 The Game Crafters game editor has some built-in tools to help you promote your game to more people. To start promoting your game, you first have to publish your game. Then you'll see a "Promote" button become available. 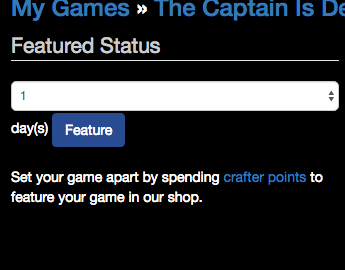 You can make your game a featured game in the shop by spending crafter points. It costs 1,000 crafter points per day to feature your game on the site. Once you've featured your game, it will be added to the featured games listing. And it will have a "Featured" ribbon added to it everywhere in the search results. This will give your game many more views than would normally be possible. After that, it's up to your images and your game description to get the user to add it to their cart. 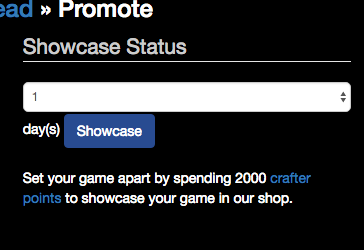 Adding your game to our Showcase costs 2,000 crafter points per day. Your game will be displayed at the top of The Game Crafter homepage and shop pages and it will rotate with up to 5 other games that are participating in the Showcase. If there are more than 5, then every 15 minutes the system randomly selects 5 games from the list of Showcased games and shows them in random order. You must have sold at least 10 copies of your game. You must get your game reviewed by an independent third-party reviewer such as Father Geek or The Gamers' Table. And you need to receive a positive review. You need to have eye-catching artwork. When you have met all of these criteria, you can apply to participate in the Showcase. Edit your game and click on the promote button. Then you'll be able to click on the Showcase button to apply. 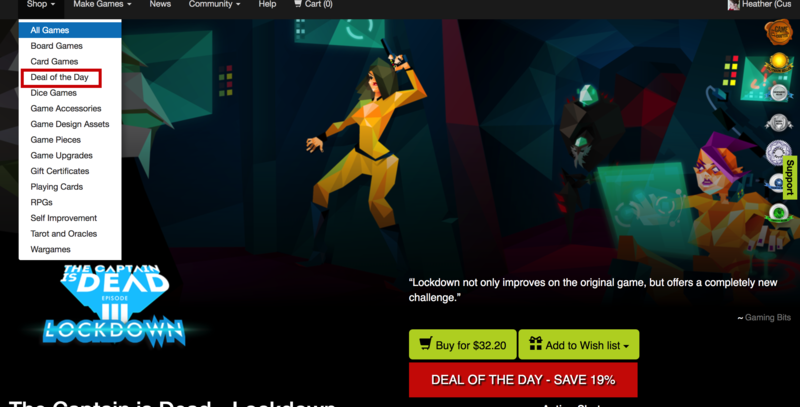 You can opt-in to promote your game at a discount via our Deal of the Day. (Please note that adult-themed games cannot be promoted via Deal of the Day at this time.) To do this, select "Yes, promote my game!" 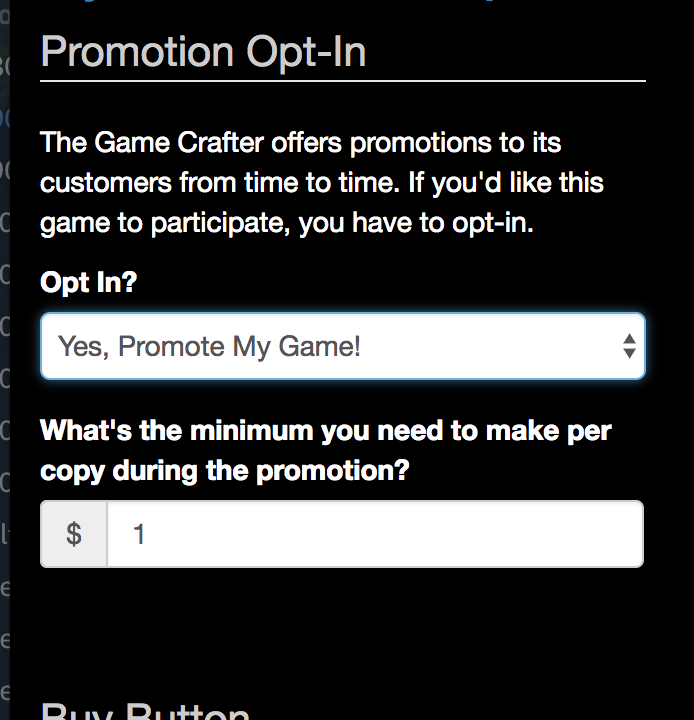 under Promotion Opt-In, and enter the minimum amount you need to make per copy during the promotion. You will want to make sure that the profit per game for the promotion is less than the current profit per game. So if your game normally costs $10 to produce, and it costs $7 per copy for 100 copies, then the discount provided by TGC would be $1.50. You can choose to lower your markup during the sale as well. So if you normally charge $13 for your game, that means your normal markup is $3 ($10 + $3 = $13). If you lower your markup to $1, then the discount would be a further $2 off. So then if we subtract the total discount ($3.50) from your normal price ($13.00) the deal of the day price will be $9.50 ($13.00 - $3.50). That's a 27% discount! The game will be promoted to our Facebook and Twitter feeds, and via e-mail to anyone who has the game on their wishlist. It will also be listed as an upsell to everyone during the checkout process, and visible under the Deal of the Day link in our Shop.